* 1: To make the sourdough starter, mix 50g (1¾oz) of the rye flour with 100ml (3½fl oz) of spring water in a large clean jar, cover with a clean kitchen cloth, and leave in a warm place for 24 hours. The ideal room temperature for the starter to ferment is 18–20°C (64–68°F). When the dough starter develops a bubbly texture and a fragrant sour smell, “feed” it with 50g (1¾oz) more rye flour and 100ml (3½fl oz) of spring water. Stir, add a little more water or flour if necessary to keep it smooth, and leave for another 24 hours. It should now be bubbling, with a fruity sour taste. Add a further 100g (3½oz) of flour and 200ml (7fl oz) more spring water and leave overnight to rise and become a fragrant, light dough. * 2: Place 450g (1lb) of the starter dough in a large bowl, add 100ml (3½fl oz) of water and the blackstrap molasses, and stir. Add about 400g (14oz) of the rye flour to begin with and work it in with your hands; it will be quite a sticky mixture. Add more flour if necessary until the dough is of a manageable consistency – neither too thin nor too thick – allowing for the fact that it is likely to thicken with standing, and that seeds will be added to it. Cover with a clean kitchen cloth and set aside to stand in the bowl in a warm place for a few hours; if the starter is vigorous enough, the dough should double in size within 8-12 hours. 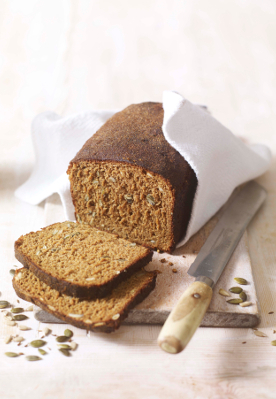 * 3: Add the pumpkin, sunflower, and caraway seeds, and salt to the risen dough and mix in thoroughly using your hands. Heat a small frying pan, add the coriander seeds, dry-fry until they release their aroma, then transfer to a pestle and mortar and crush to a powder. Grease the inside of a 900g (2lb) loaf tin with a little butter and sprinkle in the coriander powder, making sure it covers the insides of the tin evenly. Place the dough in the tin, smooth the top, dust with a little flour, cover with a clean kitchen cloth, and leave in a warm place to rest for a few hours or until it has visibly risen. * 4: Preheat the oven to 210°C (410°F/Gas 6½) and bake the loaf for 10 minutes. Lower the oven temperature to 180°C (350°F/Gas 4) and bake for a further 45 minutes. Remove the loaf from the oven, mix 2 tablespoons of boiling water with a knob of butter, and pour the liquid over the hot bread. Switch the oven off, return the loaf to the oven. Remove from the oven, cover with a linen cloth, and set aside on a wire rack to cool completely. Rye bread flavour improves during storage. Kept wrapped in a linen cloth in a wooden bread bin, or in a fabric bread bag, it will last for 5-6 days. Recipe courtesy of Neal’s Yard Remedies Healing Foods, published by DK, £16.99.